Eagles Dominate in Second Half to Put Away Duke | BANG. 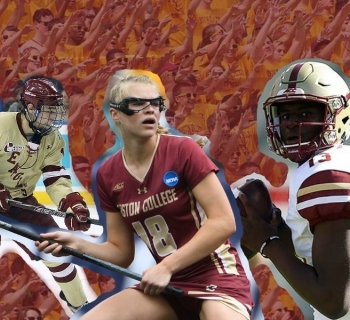 Saturday was the perfect day to be a Boston College lacrosse fan. As a matter of fact, BC’s game against Duke was a perfect day to be a lacrosse fan in general. 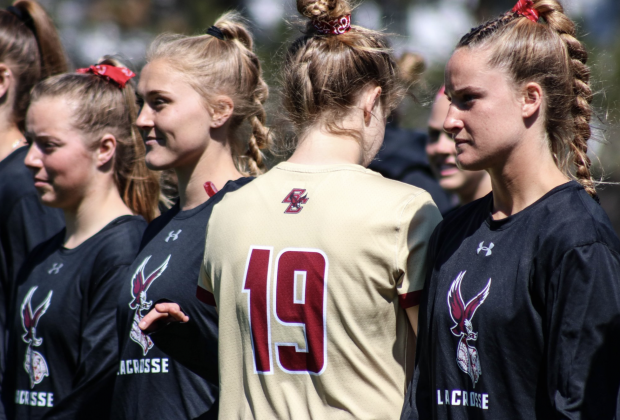 Not only did the Eagles rout the Duke Blue Devils 20-12, but the team honored Welles Crowther in their annual Red Bandana Game on a beautiful spring afternoon. Welles Crowther, a BC alum, passed away a hero during the 9/11 terrorist attacks. Crowther played lacrosse during his time at BC, and the program payed tribute to his legacy with this weekend's game. What better way to honor such an incredible man than for every player to wear a red bandana while maintaining their perfect 14-0 record. But it was not just the players who wore red bandanas. They could be seen on the sideline and in the stands all around the stadium. It was a beautiful sight to see so many people supporting one of Boston College’s most revered alumni. Unfortunately, the Blue Devils did not receive the same respect and support that the Crowther family did. Although Duke came out firing, grabbing an early lead, the Eagles were not about to go down so easily. In the first fifteen minutes of the game, the Blue Devils were either in the lead or the game was tied. With the Eagles' undefeated record seemingly in jeopardy, fans were nervous. As good as BC has been this season, it seemed shocking that they were even involved in a close game. Could Duke really give BC a run for their money? These questions lingered for a while. Although the Eagles finished the first half with a 4-1 run, Duke came out in the second half with two quick goals to cut the BC lead to just one. But BC's offensive weapons, who can score in practically whatever fashion they like, started to take over. The Eagles scored with lightning fast quick-stick passes, feeds from behind the goal that nobody saw coming, turnovers or steals that led to fast breaks, and even a behind the back goal late in the game that left the crowd roaring. Speaking of the crowd, their thunderous chants could be heard all throughout Newton while the Eagles scored seven unanswered goals in the second half. It was obvious to everyone that the momentum had grown to such a level that there was no chance the Blue Devils could fight back into the game. A notable stat from the game is how generous the Eagles were with one another when it came to sharing the ball and scoring. 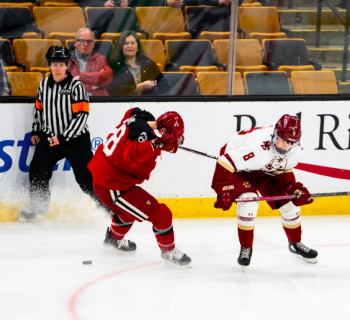 Seven different Boston College players scored, and four of them had hat tricks or more. The Eagles wrapped up a four-game stretch against all top-15 ranked opponents, leaving a message for the rest of the nation: BC is untouchable. They had some close situations in the game early on, but in the second half, this team showed that when they’re hot, they cannot be stopped. BC now moves on to their final ranked opponent of the regular season next Saturday against #21 Virginia Tech. Hopefully the Eagles can keep rolling like they have so far this season and finish up the final three games of the regular season strong. If they can continue to be as fast, aggressive, and unrelenting as they have been all season, they should be able to take care of business. The game next Saturday against Virginia Tech is scheduled for 12 p.m. and will be available to stream ACC Network Extra. The Eagles return home for a game against Yale in Alumni Stadium on April 16.